What Microsoft Internet Explorer is doing is to present the RSS feed in a user readable format. You can also click on the blue head line links to view the full stories for each news item. 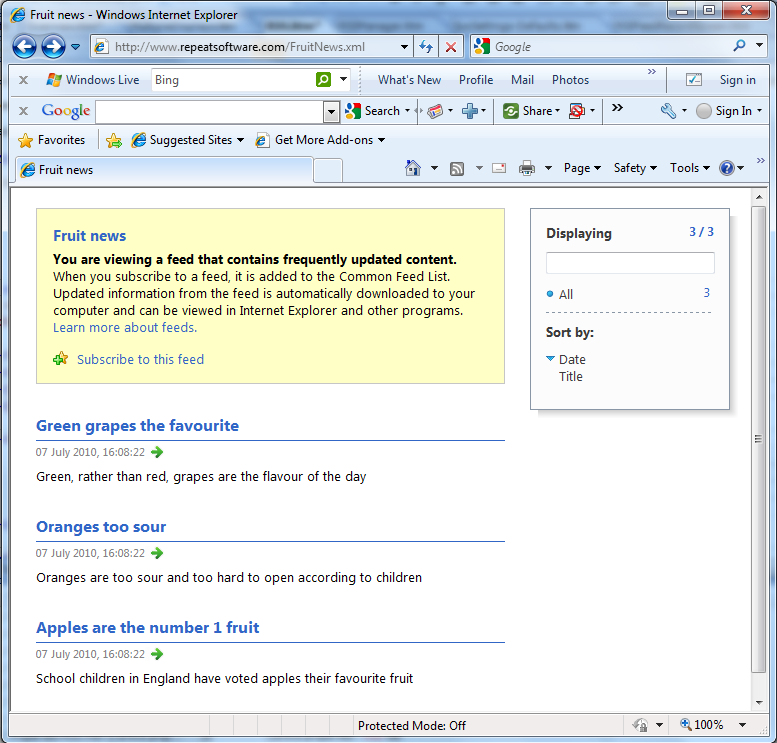 You example, in Internet Explorer, click on 'Green grapes the favourite' and this will take you to the website page http://www.repeatsoftware.com/grapes.htm. You can create a free RepeatServer.com account and this will allow you to create and host RSS feeds on the Internet free of charge. This is a free service to Repeat Signage customers and evaluators. On the main Repeat Signage screen, click on 'Utils' then 'RSS feed manager'. This allows you to create and publish your own RSS feeds to either local/network drives. You could manually upload these to an Internet website if required. If you want to publish RSS feeds to the Internet then your can use our free RepeatServer.com service to create, host and maintain RSS feeds on the Internet. There are periods when news feeds are not available, due to the massive demand on these public feeds. Repeat Signage caches the last downloaded feed file and will display this instead. You are advised to set the refresh to every 30 minutes for public feeds, so if the feed is not available then it will be collected on the next try. Double click your RSS control and look at the 'Refresh' tab. The load time of Repeat Signage presentations can sometimes be delayed whilst it is trying to collect feed and other information from the Internet during the load. There is a free RSS validation tool at http://validator.w3.org/feed/. If you are having a problem with a particular news feed, then you can check it's validity at this site. See our RSS feed list for RSS news websites. Please leave us anonymous feedback on Repeat Signage or this help page so that we can continually improve this product. Help page and Repeat Signage software copyright © 2009-2019 Repeat Software Ltd. All rights reserved.